Volunteers of the First Response Team have discovered 96 bodies of civilians buried at the Old Mosque square in Raqqa city, local sources reported. According to local residents, the square was turned into a mass grave during the US-backed Syrian Democratic Offensive (SDF) on the city. The residents, who asked to remain anonymous, complained that the offensive was accompanied by indiscriminate air strikes of the US-led International Coalition as well as artillery fire by SDF. The residents added that the SDF snipers targeted those who tried to bury their relatives at local cemeteries, which forced the citizens to use public parks and squares to bury the dead. Another 11 bodies of civilians have been discovered by volunteers under debris in the city of Raqqa, First Response Team volunteer group reported. According to the group’s statement, four bodies, including one female, were found in a mass grave at the Al Atiq Mosque square. 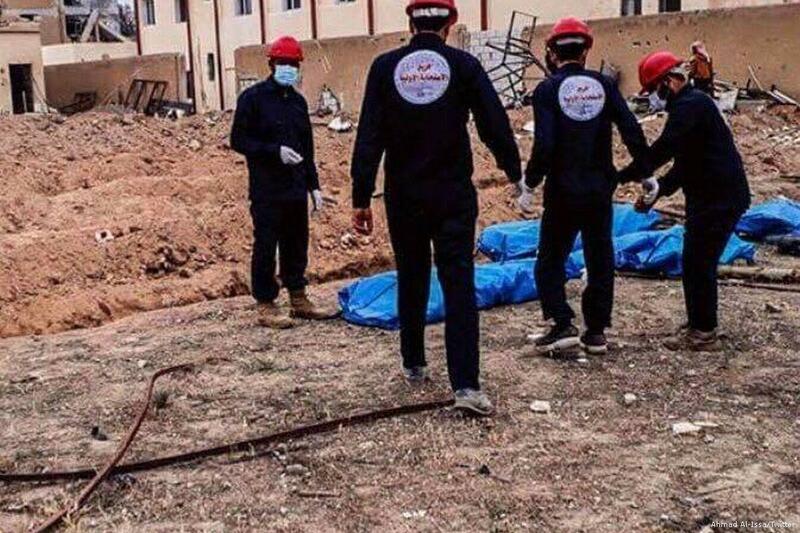 Four more corpses, including two children, were discovered under a destroyed building in Al Badou district, and another three under debris in Al Haramiya district. A total of 2350 bodies have been discovered by the volunteers since the beginning of the year, the group added. Last month, at least 57 bodies of civilians who died in the US-led International Coalition air strikes were discovered in the center of the city.